Once again I have to object to this … this wrong-headed notion … this idea that women, like a bunch of sheep, will just naturally support Hillary because she’s a woman. No, no, no! Do not keep insulting women by assuming we only know or care enough to vote M or F.
Come on, Ms. Murphy. Where did you or anyone ever get the idea that Hillary “seemed to have the female vote locked down”? And if Hillary’s camp has been working on that assumption, they’ve got much bigger problems than an email server. I’m beyond fed up with hearing about women being Hillary Clinton’s “natural constituency.” She’s a woman; I’m a woman. So what? Why would any reporter or analyst, or even the candidate herself, assume women will support her simply because she’s a woman? Being a woman doesn’t make Hillary more qualified or in any way a better choice than her male opponents. Her gender might even work against her on the world stage (dealing with Muslim leaders, for example). She certainly lacks the gravitas of Golda Meir or Margaret Thatcher. Or Jeane Kirkpatrick or Madeleine Albright, for that matter. Instead of assuming women’s allegiance to Hillary, the analysts should consider that women tend to be more critical of women than men would be. Women talk among themselves about other women, judging and assessing one another far more than men do. Women can be very “catty” about other women. Quite simply, women know women better than men do. And yours truly, speaking as a woman and a voter, does not think much of Hillary Clinton as a presidential candidate. She’s a lawyer… and that helped her back in Arkansas with the White Water scandal, back when she and husband Bill were making plans to get each other elected president someday. When Bill was elected president, Hillary became First Lady. That allowed her to pick out the curtains and dishes, host lavish parties with big-name guests, and travel widely on the taxpayer’s nickel. Bill did let her take a crack at universal health care, but as it turned out, tricky national political issues weren’t her forte. When Bill was caught philandering in the White House, Hillary assessed her plans to be president someday and promptly forgave him. Most wives, after enduring such public humiliation, would have thrown the bum out or, since he was president, would have left him, taken him for every cent he had, and lived happily ever after. The noble Hillary, however, took it on the chin for her country and stood by her man. Eventually Bill left the White House and the Clintons moved to New York. New York, you see, had a Democratic Senate seat opening up. No dummy, that Hillary. “U.S. Senator (D-NY)” would look a lot better on her résumé than “Cookie Baker, D-AR.” Never mind that it made her a very transparent and still-not-very-stylish carpetbagger. Hillary, I’m a woman voter. I’ve assessed your qualifications for president. And, Hillary, you’re no president. Most women supported Hillary, so why didn’t I? Inside Hillary’s head: What is that woman thinking, anyway? I may be a minority of one, but I try to think for myself. With a line-up like that, you can be grateful there are so many other candidates from which to choose (or not). At least with Hillary, I have some specific reasons to dislike her. Huckabee is just a wingnut, period. Worse, even, than 4 years ago. Admittedly it would be interesting to see a Hillary-Huckabee race in Ark. I haven’t a clue how that might turn out. 😀 ….. ditto on the “wingnut” characterization! It was the nicest thing I could think of on the spur of the moment. If the general public can’t figure out why Hillary’s numbers are tanking,then they have no clue about Benghazi/cellphone server gate. Oh I’m pretty sure the general public knows why her numbers are tanking. What I can’t figure out is why this particular writer (Murphy) seems to think women should ignore all the evidence and support her anyway. It’s insulting. If Hillary is the Democratic candidate, I will vote for her because my positions align more closely with hers than anyone in the GOP clown car. I also think Benghazi is a non-issue after what the committee found, and Emailgate is a partisan McScandal manufactured and pushed by conservatives and the GOP. It’s political BS, in plain English. Show me a politician, and you show me someone who has done something wrong, and THAT is what they’re throwing at her? If that’s the best they can do, she’s a damn saint–particularly compared to, oh, say, an entire war begun and waged on a lie. That said, Hillary is not my first choice for Democratic candidate. My ideology aligns most closely with Bernie Sanders. And not for nothing, but I think the Clintons are almost as played out as the Bushes. If we want to talk about Democratic women, I heart Elizabeth Warren. But I’m impressed with Kirsten Gillibrand the same way I was impressed with Barack Obama back when he was Senator. I have that same, “Here’s a rising star who can probably make a go of it someday if that’s what she wants.” Not sure she wants it, or will want it, though. Regardless, she’s one to watch. Benghazi has been beaten to death by the GOP and I don’t think there’s anything there, much as they might wish it. The email thing is entirely different, not only as it appears to this average computer-literate blogger but even more so as it appears to my son who is a developer/programmer/architect who really understands computers, security, etc. I think for her to be conducting the nation’s business via a private email account and a private server kept in her home is just beyond the pale. Her continuing denials, excuses, cover-ups, and prevarications about it have just made it worse. Liz Warren would get my vote in a second if she’d run. She knows where and how the bodies are buried and isn’t afraid to wade in there and dig them up, to my complete and total delight. Sanders is appealing but I’ve not examined his platform in detail and suspect some of it may be too liberal for me (but maybe not enough to keep me from voting for him. All votes are compromises). And I confess that off the top of my head I don’t know who Kirsten Gillibrand is. As I hope I noted above, I’ve not really gotten into this election yet. It’s way too soon for me to care. I can say, however, that there is no one in the Republican circus that I’d vote for. Interesting. Your points regarding the “women’s vote” are precisely what my son has been drumming into me for a while now when we discuss politics. You, and he, have made a believer out of me. I’m glad there is no such voting bloc. Well, then that makes at least three of us who think there is no such voting bloc. Apparently very few (if any) people know that the USA is a constitutional republic with limits on government endeavor. Most of the reasons given for supporting or opposing a particular candidate seem to ignore their history of constitutional ignorance. Sad. Yep, I’ve not only lost faith in those in Washington, I’ve lost faith in the American electorate. I’m still undecided when it comes to Hillary. Personally, I love Bernie Sanders. 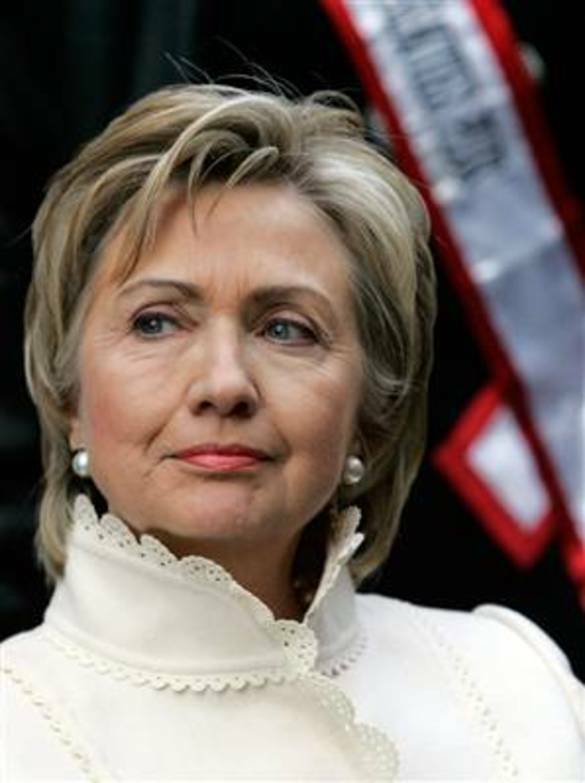 The one nagging thought that I have about Hillary, though, is that even if her popularity was soaring and she is a very strong candidate to win the Dem ticket, I think there are too many people of power, along with the GOP, that will NOT tolerate a woman at president. It was bad enough for the GOP to have a black man take that seat, but a woman? I think they’d commit mass suicide before they’d let that happen. That having been said, they are going to do anything and everything in their power, whether true, twisted facts, or complete fabrication, to make sure she doesn’t make it to the Prime Commander’s seat. Even if Biden decides to run, I don’t think his heart will be entirely in it. I’m afraid Biden may already have waited too long to get into the race if he were going to. But one pundit thought that if Hillary keeps dropping in the polls, there might still be a good time for Biden to jump in and “save the party.” I don’t know. I’m so totally disenchanted with Hillary and only lukewarm on Bernie Sanders. I foresee my vote next November being not for anybody but against the Republican nominee, since there isn’t one of them I want to see in office. I’m sure you won’t be the only one. It’s like that pretty much every election these days. I really like Sanders so I’m not feeling like it’s the best of all the evils this time. I’ve not really gotten interested enough yet to study the candidates. Hillary’s email mess and Trump’s bombast are about all I’ve paid attention to so far. I listen to progressive talk radio all day while working for several years now. Bernie Sanders is often a guest on the Thom Hartmann show and they call it “Brunch with Bernie.” So for while now I’ve been listening to him and he is an incredible person. So “for the people.” He won’t accept any PAC money as he doesn’t believe in it. His integrity is above and beyond all of those on Capitol Hill. You should start listening to him. I think you’ll like him. Saw him on Stephen Colbert last night and liked what he had to say. As I recall though, when I looked into his platform a while back, there were a couple of things that sounded too liberal for me … although I could’t tell you now what they were. I’m sure everyone has something they don’t like with each candidate. The major thing I think that will hurt him is he is Jewish. Although treatment for Jewish people has become more civil through the years, there are still many people who hate. I wasn’t aware he’s Jewish. Shows you how little attention I’ve paid to the candidates so far. But judging from how he’s doing in the polls, it doesn’t seem to have hurt him so far. No. But I’m sure it will come up. The problem with Hillary as candidate, and you bring this out well, PT, is that her desire for office is contrived. It is more about her personal ambition than any serious interest in or concerns about the major issues. This seems evident to me in the contrived and structured way she speaks in public. There’s natural and then there’s Hillary. As for the male/female issue, I would have thought a female president would be at a disadvantage with world affairs but I must admit that Angela Merkel is doing a good job. There have been some female leaders who have excelled on the world stage and I mentioned a few. I don’t think Hillary even comes close in terms of believability, gravitas, respect, or anything else. She just isn’t believable and genuine. I think that every time I see her speak. Every word, every gesture, every glance, looks carefully rehearsed, or as you said, “contrived.” I’d be hard pressed to say exactly what makes me feel that way, but that’s the way she comes across. I feel like I’m watching a robot.